Dell announced three new commercial workgroup printers to help businesses of all sizes increase productivity and lower their total cost of printing. 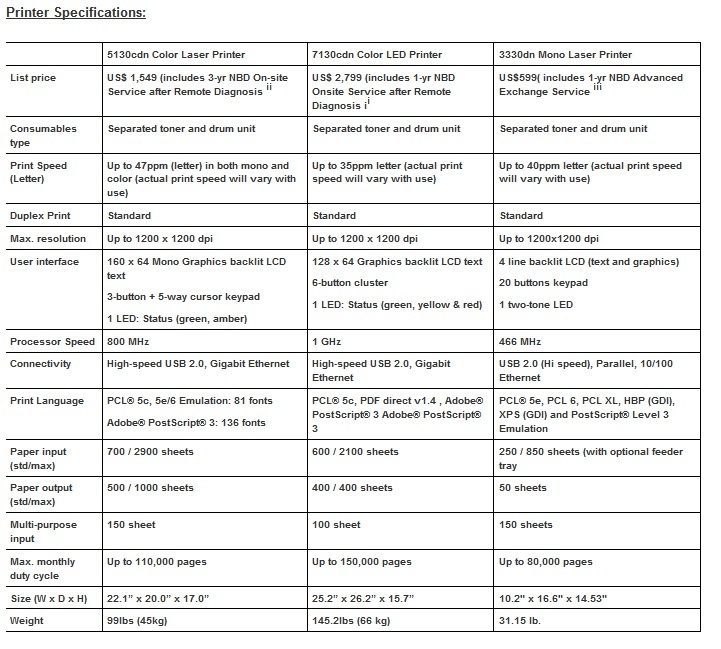 First of all, the Dell 5130cdn is the “world’s fastest single function letter-size office color laser printer. It can print up to 47 single-sided and up to 37 double-sided letter pages per minute in both mono and color. It includes the ColorbyDell to delivers excellent color saturation and image sharpness and outstanding print quality. Next, the Dell 7130cdn is the company’s first LED color printer with tabloid-size printing capability. It is capable of producing Pantone approved color prints. It gets “numerous paper handling options, a powerful processor and robust memory”. Lastly, the Dell 3330dn is a single-function black and white performance printer that can print up to 40 letter pages per minute. It offers a monthly duty cycle up to 80,000 pages. These new printers are available now. The 5130cdn starts at $1,549, 7130cdn at $2799 and 3330cn at $599.